The Boston Bruins made the postseason last year after a two-year absence. That's a little deceptive, though - they actually had one more point in 2015 when they finished fifth in the Atlantic Division than they had last year when they finished third. These three somewhat mediocre years came right after they won the President's Trophy for having the most regular-season points, but salary cap woes forced them to rebuild on the fly. They have done a good job of it and appear to be on the verge of pulling it off without having to blow everything up and start from scratch. This is a big year for them, though. They really need some young guys to step up and help lift this team to the next level before the window slams shut as Brad Marchand and Patrice Bergeron get too old to still be the top-level offense threats that they are. Before they can move forward, though, the team has a bit of an ugly situation to deal with. After playing only parts of the prior two seasons and spending time in the AHL both years, 21-year-old David Pastrnak not only stuck with the big club last year, but playing largely with Marchand and Bergevin he had a breakout year - 70 points in 75 games. Pastrnak was drafted in 2014. So was Leon Draisaitl, who similarly broke out last year and who was rewarded with an eight-year, $68 million dollar deal. 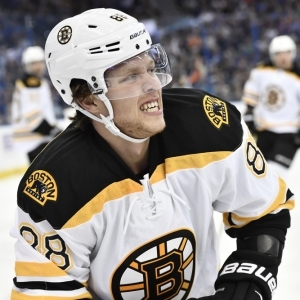 Pastrnak is a restricted free agent. He obviously wants something close to Draisaitl money, and the team obviously wants to avoid going right back into the cap woes they have spent the last three years climbing out of. A salary that big would also be higher than anyone else on the team, and that could cause some issues for the squad. Both sides say they want a deal, but progress has been slow. This could be a distraction for the team, and it may even lead the team to deal Pastrnak, which would be a big blow - you never get equivalent value for a malcontent. With the Pastrnak deal not done, the team had a reasonably quiet offseason. They let some guys leave in free agency, but none who are likely to come back to haunt them. They also only added a few low-cost pieces in free agency. The most interesting was Kenny Agostino, a left winger who was the MVP of the AHL last year but is now onto his fourth NHL organization without making any kind of real impact in the big leagues. The team drafted a QB they are quite excited about in the first round of the draft this year. Urho Vaakanainen, who has been playing against men in the Finnish Elite League, is probably two years away from the NHL, but he's one to watch. This team is very top-heavy offensively, and that will be even more of an issue if Pastrnak doesn't get sorted out soon. Guys like David Backes haven't been carrying their weight, and it's tough to imagine him taking a big step forward. Defensively they have some young guys to get excited about - Charlie McAvoy looked good in the playoffs in his debut, and Brandon Carlo is exciting, too, after playing on the top paring all season last year as a 19-year-old. The biggest issue defensively, though, is that they are still dependent on Zdeno Chara, and at 40 he is a shell of what he once was. Goaltending remains a strength, and it will have to be given their offensive situation. If this team isn't at least 5-1 after their first six games they should panic, because schedules don't get any softer than this. Opening against Nashville could be tough, but it's easier with the news that Ryan Ellis is out for 4-6 months. After that things are laughable - home and home against Colorado, at Arizona and Vegas, and then home against Vancouver. If you threw in New Jersey and Detroit you'd have all the worst teams in the league. Bovada has Boston at +2500 to win the Stanley Cup, which has them tied with Calgary and San Jose, and behind 14 others. BetOnline has the Bruins at +1400 to win the Eastern Conference, which puts them eighth in the hierarchy. They are the fourth choice to win the Atlantic Division at +425. The season win total sits at 44.5. They won 44 games last year. I'm not particularly optimistic. They will be in the wild card mix, and should be somewhere around where they finished last year, but with the offensive issues and defensive questions I think they are more likely out than in - especially if they don't get Pastrnak on board soon.